The Vermont Non-GMO Cookbook honors the state’s mission to connect with its local organic farmlands and the farmers who nurture and care for them. It also serves as a guide for eating organically and non-GMO in Vermont. The book celebrates the region’s esteemed organic food producers, farmers, cheesemakers, dairy farmers, and the chefs who partner with them to create delicious, innovative, organic, and non-GMO recipes. In addition to mouthwatering recipes, The Vermont Non-GMO Cookbook will include profiles of a hand-selected group of pioneering organic Vermont farmers, chefs, and non-GMO artisans. It will take you on a culinary journey throughout the Green Mountain State, from Ben & Jerry’s homemade ice cream to internationally inspired Kismet Kitchen to the busy Butternut Mountain Farm. Supported by rustic food photography, it will awaken and inspire your palate to the exciting options being offered by Vermont’s burgeoning local, organic, and non-GMO food scene. 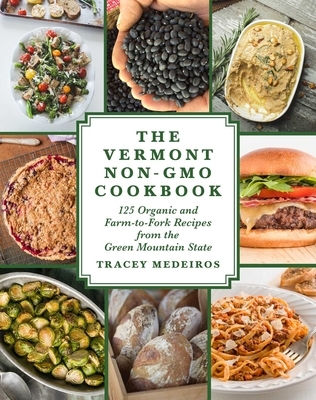 Tracey Medeiros is the author of The Connecticut Farm Table Cookbook, The Vermont Farm Table Cookbook, and Dishing Up Vermont. She writes The Farmhouse Kitchen: A Guide to Eating Local column for Edible Green Mountains magazine and is also a freelance food writer, food stylist, and recipe developer and tester. She is often seen on various television cooking segments preparing one of her favorite recipes while sharing helpful culinary tips with the viewing audience. Tracey travels regionally as a guest speaker and cooking instructor, emphasizing her commitment to the sustainable food movement by using locally produced fresh ingredients to create dishes that are healthy and delicious.